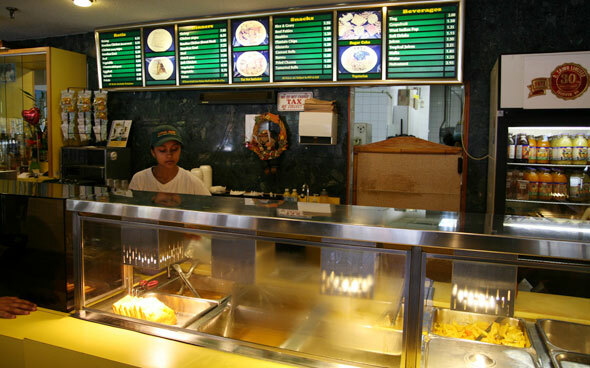 Island Foods is the old stalwart of the Toronto roti scene. It's been around for almost 35 years, has maintained a booth at the CNE since 1976 and still operates two bustling downtown locations - one at the Grange foodcourt across from OCAD and the other at King and Dufferin. With an apartment near Queen and Ossington I've been frequenting the latter location for some time now. It's one of the many roti restos within a mile of my place and competes with the likes of Gandhi and Bacchus for my occasional roti cravings. The offerings here are decidedly different than what you'll find at the other spots. The cooking style is Trinidadian which provides a more fluid texture, gravys, sauces and milder spicing (unless you ask them for a heavy dose of hot sauce). Almost all meals are potato based. All rotis come with potato. There's straight-up potato ($4), shrimp ($6.55), boneless chicken ($6.35), goat ($6.10), beef ($5.85), channa ($4.50), eggplant ($4.50) and spinach ($4.50). 75 cents are added for each additional ingredient. Also on the menu are a variety of dinners, the highlights of which are oxtail stew ($7.90), shrimp ($7.65) and chicken ($6.25). Doubles ($1.30), beef patties ($1.30) and tamarind balls ($1.25) are also available. For the full menu, check out Island Foods' web site . My regular order is a spinach and channa roti (pictured top). Like most of the meals, part of the order is prepared in the back kitchen while some of the ingredients are supplemented from the trays under the heat lamps next to the cash. While the presence of heat lamps might foreshadow quality issues from a lesser place, at Island Foods it's not really a concern because the restaurant is almost always busy. Lineups are the norm during peak lunch and dinner hours and all through the day they seem to do a fairly brisk take-out business. Faded yellow tables provide the backdrop for those looking to dine-in . 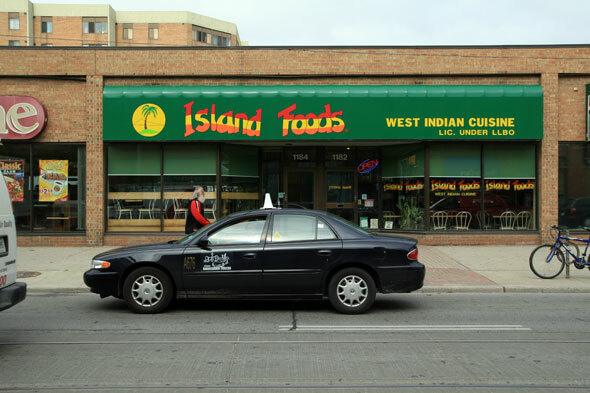 So where does Island Foods fall in Toronto's roti hierarchy? Flavour-wise, for a West Indian style roti it's tough to beat. But while prices here are a bit cheaper than the competition, size-wise the rotis are about 2/3 as large. And this in my opinion is the lone drawback with Island Foods. While the kitchen (and heat lamps) consistently deliver the flavour, the rotis just aren't big enough to satisfy me like the alternatives.